The Mollo Law Firm has been an active presence in the New Jersey for years. Located in the heart of Monmouth County, and due to its proximity to many shopping plazas, Al Mollo has appeared in the municipal court for theft and shoplifting cases for over a decade. The value of having a local attorney represent you is of the upmost importance. The Mollo Law Firm handles a variety of criminal matters including, but not limited to, DWI, shoplifting, traffic matters, drug possession, assault and battery, and many other criminal lawyer cases. Sears is an international retail sales company founded by Richard Warren Sears. Sears has its roots in the United States of America, originally as a mail order catalogue. Since its boom in the fifties and sixties, Sears slow decline allowed it to be absorbed by Kmart and is now legally, Sears Holding. Until the late eighties, Sears was renowned as America’s largest retailer. There are many factors that might contribute to someone stealing an item. Maybe you didn’t know it was there? Often items get stuck in strollers and coats and the consumer was unaware that they were even carrying the item? Maybe you were caught stealing, but you thought you had paid for the item? Maybe the stolen goods was placed on you by someone else? Babies and small children are notorious for this. Whatever the details are that surround your theft charges, The Mollo Law Firm can help you. Was a shoplifting arrest made? Which Sears employees spoke to police? Sometimes people are arrested, but because they are not handcuffed, they believe they were not arrested. What were you charged with? Was it just shoplifting? Was it possession of other items, perhaps drugs, or drug paraphernalia? 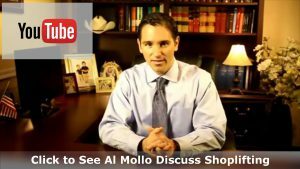 Mr. Mollo can clear up the details surrounding your arrest and the best approach to resolving your Sears shoplifting charge.